Uncategorized | Hey, Mrs. Winkler! My summer is winding down. On August 13, I head back to work. To say I’m ambivalent about doing so is an understatement. Reading emails about re-accreditation responsibilities and changes in policy are already making my insides churn, but I will NOT go down a road of resentment and bitterness that is sure to get me nowhere. I will focus on the only thing at work I have any control of–the classroom. In my next blog, I will continue to write about some of the changes I am making in my instruction, but for now, I have some unfinished summer business to attend to. First of all, I have extended the deadline to August 15, for submissions to Teach. Write. : A Writing Teachers’ Literary Journal. Check out the submission guidelines here. I have also decided to OPEN UP SUBMISSIONS TO ALL. I realized that writing students (virtually everyone has been a writing student) as well as teachers need to have a voice in Teach. Write. However, I do request that in your required third person bio that you include your composition teacher experience, if you have any, or explain the impact writing instruction has had on you. I am open to both positive and negative experiences as long as you don’t blame English teachers for everything that has gone wrong in your life. Secondly, I am still not finished with either the play Death or Love?, about the work of Elizabeth Barrett Browning and Robert Browning, or my novel Flood. I have hope that I will finish the play, but the novel will not get finished this summer. It just won’t. I am excited about it, though, because I have made great progress in developing the plot, as well as doing meaningful research and revision. My personal deadline is now December 31. To make completing the novel a real possibility, I am once again going to participate in NANOWRIMO (National Novel Writing Month). This time, however, I am going to attempt to involve my students by providing times, places, and maybe even snacks, so we can write together during the month of November. Finally, I should report on my greatest successes of the summer: incredible trip to Germany to visit my brother and his family, two meaningful and inspiring writers’ conferences–one at Brevard College with Craig Johnson, author of the Longmire mysteries, and the other in Raleigh with Elaine Neil Orr, whose latest book Swimming Between Worlds has won praise from Lit South and author Charles Frazier, who wrote Cold Mountain. Eye surgery was virtually painless and has resulted in 20/20 far-sighted vision in both eyes. I will have to wear reading glasses, but the difference is simply amazing. My surgeon, anesthetist. nurses, and other hospital personnel were friendly, thoughtful and comforting. I can’t say enough about my regular eye doctor and his staff who have taken good care of me for years. They were all so efficient and helpful. My greatest success was spending quality time with my husband and daughter. I don’t have enough time in this blog post to recount how great it has been, so I will simply say that I have been refreshed–body, mind, and spirit. Now, my new goal–to not wait until a vacation rolls around to give myself the care I need to be the most effective teacher I can, helping my students become better writers while developing the soft skills they need to navigate an increasingly complex world. I am a teacher, but I am also a writer, wife, mother, friend, member of more than one community. I can’t wear all of these hats only in the summer. I can’t ever wear them all at once. Self-care means moderation and balance, sloughing off the worry that wastes precious time and produces nothing. Still ambivalent? Yes, I’m afraid so, but that doesn’t mean I am not ready to enter the fray and fight the good fight. The GOOD fight. Economists and lawyers like using words like “nonpecuniary.” Perhaps to keep from falling into cliche; however, if the cliche fits…and when it comes to education, it certainly does–Education should not be all about money. Amazing thing is, even economists (those trusted above all others in our society these days) frequently do studies on the benefits of various aspects of our lives that do not involve money but make our lives better. All of the tables including relevant data show statistics before and after conditioning for income with the same result of increased rates in these various areas as education increases. Oreopoulos and Salvanes do report some predictable negative effects of higher levels of education, including time constraints and increased stress (p. 171). However, these aspects of higher education are greatly mitigated by the numerous positive effects, including those mentioned above, as well as less tangible benefits, including improved parenting (p. 167), higher levels of trust (p. 167), increased patience (p. 170), and even higher levels of happiness (161). the theory that most students are optimally trading off costs and benefits when deciding how much education to acquire. Some people are missing out on significant welfare-increasing opportunities (p. 181). youth are particularly predisposed to downplaying or ignoring future consequences…. When teenagers and young adults make their choices about school attainment, it may be especially easy to see the immediate costs and harder to grasp fully the long-term benefits. Exploring these issues more thoroughly would shed further light on the overall education attainment decision-making process and help identify ways to make individuals recognize the large returns from schooling. Large amounts of money appear to be lying on the sidewalk. Of course, money isn’t everything. In the case of returns from schooling, it seems to be just the beginning (p. 181). On a more celebratory note, I have mentioned in my blog before that I had a piece published in the anthology Unbroken Circle: Stories of Cultural Diversity in the South. Since publication last May, several colleges have begun to use the anthology as a text in courses on Southern literature and culture. Several months ago, writers included in the anthology were asked if they would like to participate in a panel discussion at the 40th Annual Appalachian Studies Association Convention. I am happy to report that the proposed panel session was accepted by the association, so four of the 26 writers, including yours truly, as well as editors of Bottom Dog Press in Huron, OH will travel to Cincinnati to attend the conference. I will be reading from my story, as well as discussing the meaning and inspiration for it. Of course, I will be part of the Q&A after all writers have completed their readings. The conference is during our spring break in April, so my intention is to take along some copies the new edition of Teach. Write. to share with editors and publishers, so there isn’t a better time to submit to the spring edition. Submissions are open until March 1. What a great start! Last evening, before and during dinner I was privileged to have casual conversations with two great writers whom I greatly admire–Robert Morgan and Jane Smiley, both so pleasant and unassuming. Sy Montgomery is a writer I haven’t read but now definitely plan to and share with my nature-loving friends. She is a naturalist and writes often about ocean life. 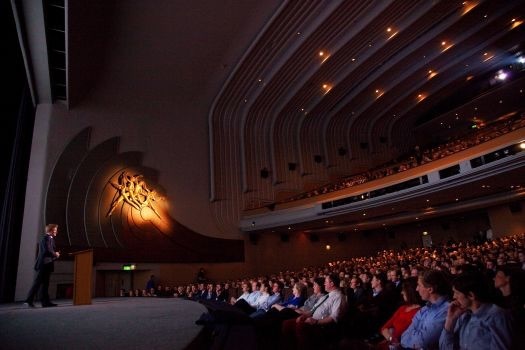 She spoke about discovering new languages when encountering new landscapes often alien to humans–like breathing underwater. She spoke eloquently about the transformative power of her underwater experiences. Jane Smiley spoke about learning of the importance of place when reading David Copperfield and how truly great novels are often dependent, at least in part, to setting, which is tied to theme. Robert Morgan mentioned the paradox of writing that can be regional, even local, that is at once extremely specific and accessible to readers universally. Robert Morgan also spoke about how it is sometimes counterproductive to actually visit or re-visit the place of which one is writing–sometimes better to let it live in one’s imagination. Sy Montgomery talked about seeking out people who have lived in a place and interacted with it to discover new things about it. All that and more in just an hour! I am certainly getting my money’s worth. That was day one. I have much more to say about today–Day Two, but it will have to wait. Tonight we have the banquet, reception and Jane Smiley ‘s reading. Stay tuned! I finally did it! I am now accepting submissions for the Fall 2017 premiere edition of TEACH. WRITE. Click on the link above to see the submission guidelines and Happy Writing, Teachers! Anyway, working hard on the play has kept me from posting on my blog, so when I read a great editorial about the failures of the Bill and Melinda Gates Foundation’s educational reform efforts, I had to post. Many state governments have drastically changed polices and programs, poured resources, especially administrative and faculty resources, into initiatives promoted, and only partially paid for, by the Bill and Melinda Gates Foundation. Now that many of these initiatives are failing, the foundation is beginning to pull out, often leaving the educational systems to fix the mess. Many educators, like me and some of my colleagues, have tried to warn administrators about the potential problems with these plans, but to no avail. Why listen to the people who are in the classroom day after day and work most closely with students? What do they know about education? Let’s allow people who know little about education but have lots and lots of money and political power dictate to dedicated educators with years and years of experience how best to spend money on reforms. Yeah, that makes sense. Had a fabulous day! I had bought croissants at the Tesco’s across the street yesterday. They tasted great with my morning coffee. 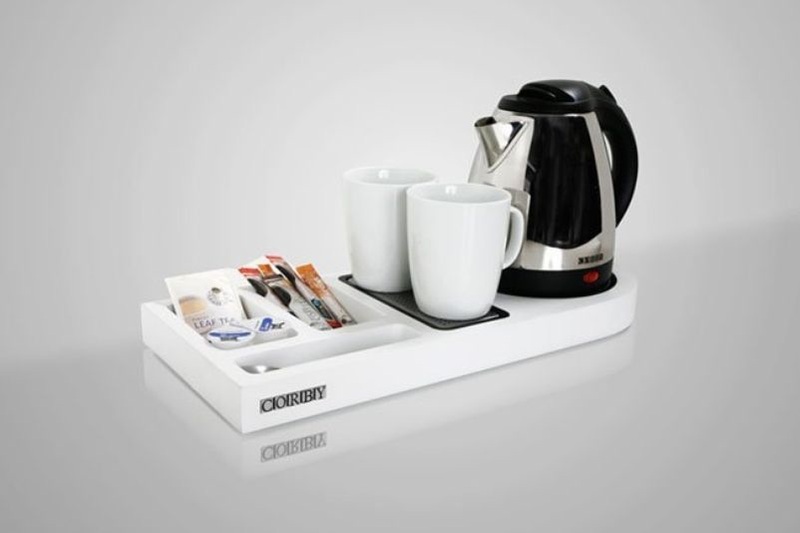 The hotel coffee service is a bit different than in America because the main bevrage of choice is tea rather than coffee, so all the hotels have a little electric kettle and a tin (can) of teabags and instant coffee. I had been drinking tea, but today I decided to have coffee and, boy, that was the best instant coffee I ever had. I ate a few of the cocoa almonds I packed to give me some protein for my long hike ahead. It was raining when I woke up, but by the time I did a little work and got dressed, I could see a few patches of blue. Then I checked google maps and planned my day. Since the rain had let up, I decided to go to Hyde Park as planned. I thought I might take the Underground, but I discovered that the line I needed was closed, so I decided to walk. The directions on Google maps were very good and I saw so much along the way. 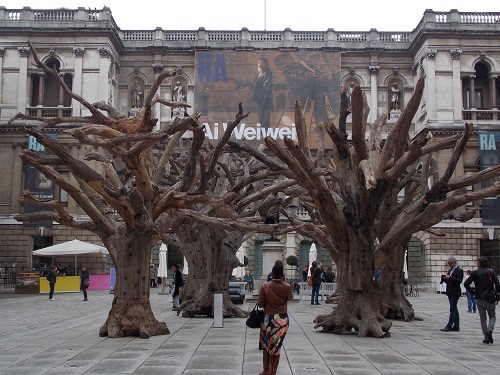 I stopped briefly at the courtyard of the Royal Academy of Arts to take a look at the interesting sculptured trees by Chinese artis Ai Weiwei. The trees, made of various pieces of driftwood bolted together, represent the ethnic diversity of China according to the academy’s website. I was also interested to see that the astronomical society and geograpical society are also housed around the same courtyard. I continued my walk and found myself eventually on Oxford Street, the longest stretch of my walk. I was stopped by a young woman collecting money for a group called Oxfam that helps communities in developing countries have access to clean water. Here is the website adress: http://www.oxfam.org.uk. We talked quite a while, and as she did I was reminded forceably of the tradition of reform and charitable spirit that weaves its way throughout British history and literature. After I said goodbye to Georgia and continued walking along, the sun kept peeking out from the clouds and by the time I got to Hyde Park, the sun came out. 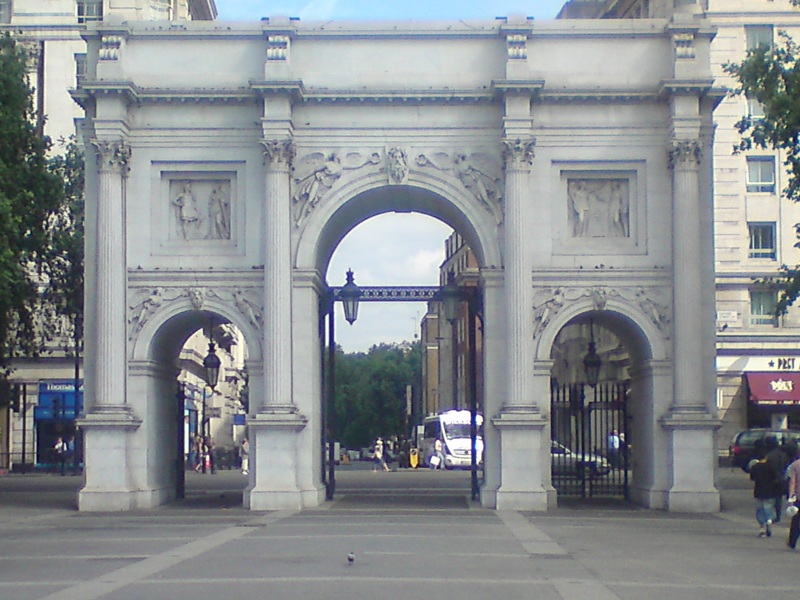 To get to the park I passed through the impressive Marble Arch. Then into the park! 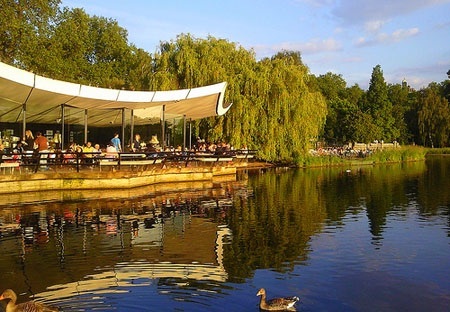 I love Hyde Park, and I just saw a little of it. I took many pictures and walked to the lake. There is a little restaurant right by the lake and it was warm enough to sit at an outside table. I have been so good and exercised so much that I treated myself to fish and chips and a half pint of beer. I thoroughly enjoyed it. Then I walked it off by walking through Picadilly Circus where the famous statue of Wellington is, along with other war memorials. I kept walking to Leicester Square where I’ve been before. The Serpentine Bar and Kitchen where I ate some great fish and chips. I decided to watch another movie. This time I watched Spectre, the new James Bond flick, on the big, big screen at the Odeon Theatre that is famous for its premiers. In fact, Spectre had premiered there on Sunday when my friend and I saw The Suffaragette. It was a totally outrageous movie but I do love a good action flick. When I came out there was another premiere going on at another theater, but I couldn’t get close enough to see much, but I think I saw the top of Bradley Cooper’s head! I took the Underground back and now I am once again safe in my room, watching, what else, Harry Potter! Tomorrow I plan to go to the British Museum and maybe a little museum called the Soane, which is close to the Thames. Then, I have tickets to see Imelda Staunton in Gypsy, my last big show! Many of you will recognize Staunton as Dolores Umbrage in Harry Potter. I’m very excited to see her as Rose in Gypsy. Looking forward to my last day in LONDON.